Lower Voice and Data Bills are Possible! Would you like lower voice and data bills every month? Many businesses are overpaying every month for their phone and internet service. 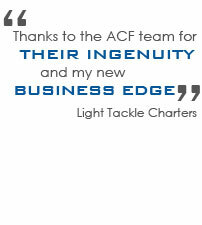 A risk free, no obligation voice and data analysis from ACF Consulting can help your business save money every month. You have nothing to lose except an expensive phone bill! Phone and internet service is a business necessity, but that doesn't mean you have to pay expensive bills every month. ACF's voice and data analysis will compare your current phone and internet service costs to the costs of systems that are equal or better value. This free information could save your company hundreds of dollars. You have nothing to lose! Sometimes saving money means compromising quality, but that is not the case with phone and internet service! ACF can help you lower your voice and data bills every month without having to give up your current provider's features or quality. Often times, we can find ways to give you more features at a lower cost! A voice and data analysis can help you make better decisions about your phone and internet service. Contact us today to take advantage of it! Our voice and data analysis is 100% free! There is no pressure to buy or switch to a different phone or internet provider. If you find out that your current service isn't costing you any more money, you have no pressure to switch! We simply want to provide you with information so you can make an informed decision about your business. It is all a part of our personal approach to effective business solutions.